Poor Man's Books for the rare and obscure. Title: THE NEW WORLD, A WEEKLY JOURNAL OF POPULAR LITERATURE, SCIENCE, MUSIC, AND THE ARTS (NEWSPAPER) OCTOBER 10 1840 TO JUNE 26, 1841 [Lbc]. Other Notes: We fit archival quality clear acrylic covers for additional protection whenever possible. B&W Illustrations; Folio; 412 pages; This collates complete. Begins with Vol I No. 19 and then a complete run to Vol II NO. Although the Title Page mistakenly states "January to July 1841 " the actual dates are "October 10 1840 to June 26, 1841". 3/4 leather over marbled paper covered boards. The volume is tight and solid with scattered foxing. Many events occurred in 1841 such as John Sutter buys Fort Ross north of San Francisco, ending Russia's thirty-year presence in California. Sutter dismantles the settlement and carries it to his newly established Fort Sutter at the junction of the Sacramento and American Rivers: John Bidwell organizes the Western Emigration Society and leads the first wagon train of pioneers across the Rockies, a party of 69 adults and children who divide into two groups after crossing South Pass. One group heads north into Oregon, while the other, led by Bidwell, continues west to California, suffering desperate hardship and near starvation before arriving in Sacramento, where Bidwell finds work with John Sutter: Southerners hold both the presidency and the vice presidency (may or may not be covered in these papers). Page size is 15.25"x11".. Among the contributors were John J. Audubon, Carlyle, Dickens, Marryat, Poe; and reviews of contemporary books. 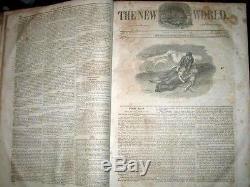 The item "THE NEW WORLD, A WEEKLY JOURNAL OF POPULAR LITERATURE" is in sale since Monday, December 22, 2008. This item is in the category "Books\Antiquarian & Collectible". The seller is "kenpa" and is located in New Jersey USA.